In the world today there are many complex problems related to corrosion. It has been established that annual costs resulting from the corrosion of metal are very high. This immense loss is the result of product which must be sold as low quality products or must be disposed of as scrap, processed or something similar. The high price of corrosion also includes the transport costs of returned goods. Cortecros d.o.o. (limited liability company), as the general representative of the Cortec Corporation offers products which contain patented VpCI technology for protection of metals with a solid molecular link. The VpCI system eliminates the shortcomings which appear in traditional inhibitors and protect metal from corrosion from the very beginning and on the entire surface of the metal. Spraying, immersing, insertion or coating of metal with the VpCI formulation, films, paper or sponges, ensures fast and economic protection of exterior and interior metal surfaces. By using Cortec Corporation products you will ensure long-lasting and complete protection of products prone to corrosion. The process of minimising and disposal of hazardous waste is the concern of the manufacturer absorber for collection and prevention of spilt hazardous liquids, and finally consumers themselves. SPC International of which Cortecros d.o.o. is the authorised distributor has developed products for the absorption of spilt oil derivatives, crude oil, chemicals and other liquids. Cortecros d.o.o. offers a wide spectrum of SPC products for absorption, like absorbers of various forms and dimensions, absorbing protective barriers, barriers for retaining spilt liquid on water surfaces, ECO sets for accident situations, organic absorbers, equipment for storage and manipulation of hazardous chemicals, etc. The company CorteCros d.o.o. will secure products, engineering and consulting for you, for application of the product for protection against corrosion, as well as application of products for the prevention and collection of spilt oil derivatives and chemicals. CorteCros d.o.o. provides its customers with services to meet their needs and increase the life span of their equipment and work resources. Bionetix® International Celebrates 20th Anniversary of Providing Natural Bioremediation Solutions! Bionetix® All-Natural Plant Bio-Stimulant and Soil Microbial Enhancer Has Potential to Boost Crop Health! Cortec® Adds Extra VpCI® Protection to Time-Proven Corrosion Inhibiting Coating! MCI Technology Preserving War - Destructed Monument and Symbol of Croatian Independence! Cortec Daughter Company Announces New Brochure: High-Tech Integrated Solutions for Corrosion Protection! Cortec Daughter Company Announces New Brochure: High-Tech Integrated Solutions for Corrosion Protection Featured in Mid East Info Magazine! Bionetix Provides All-Natural Feed Additive to Boost Health of Aquatic Species! Research Paper on Biobased Rust Coatings To Be Presented at EuroCorr 2017! Sludge Treatment - Bionetix International Fizzy-Tab Featured in Pumper Magazine! Research Paper on Biobased Anti-Corrosion Coatings To Be Presented at EuroCorr 2017 by Cortec® Corporation Featured in Construction Technology Magazine! Biodegradable Scale and Rust Remover from Cortec® Contains 100% USDA Certified Biobased Content! Battling Corrosion with Vapor Corrosion Innhibiting Coatings Featured in Coatings Tech Magazine! Cortec® Releases Non-Toxic Corrosion Inhibiting Graffiti Remover in a Recyclable EcoAir® Spray Can! Cortec Middle East profile Featured Inside Oil and Gas Magazine! CE Certification Opens EU Market to Six Cortec® MCI® Concrete Protection Products! Tips for Industrial Boiler Lay-Up Featured in Process Heating Magazine! Cortec Introduces Food-grade Grease Featured in Machinery Lubrication Magazine! BCP12 Featured in Pollution Equipment Magazine! Overcoming Winter Wastewater Challenges Via Bioaugmentation Featured in TPO Magazine! CorteCros® 20th Anniversary: Journey from Small Startup to Successful Corrosion Engineering Company! CorrVerter MCI® Technology Utilized to Preserve War - Destructed Monument! Cortec® Introduces EcoLine® VpCI®642: An Economical Biobased Corrosion Inhibitor for Seawater Hydrostatic Testing Featured in AZO Cleantech Magazine! Corrverter MCI® Technology Utilized To Preserve War - Destructed Monument Featured in IPCM Magazine! Cortec® Receives CE Approval for Migratory Corrosion Inhibitors (MCI®) Products for the European Market! Bionetix® Improves Portable Toilet Appearance, Odor, and Ease of Pumping with Bluer, More Fragrant Natural Treatment! Cortec Offers a Fresh Look at EcoClean®/EcoSpray Featured in Automotive Magazine! Monumental Preservation Featured in PCE International Magazine! New BioCortec® Brochure Underscores Cortec’s Commitment to Providing Sustainable Corrosion Solutions! Refinery Water Treatment Extends Service Life, Increases Efficiency Featured in Fabricator Magazine! Refinery Water Treatment Extends Service Life, Increases Efficiency Featured in Oil & Gas Magazine! 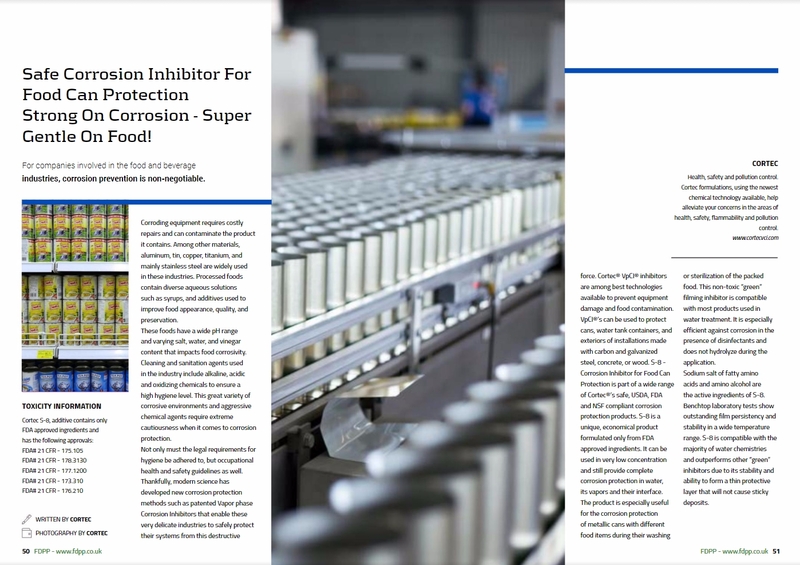 Safe Corrosion Inhibitor for Food Can Protection Featured in Food and Drink Processing Magazine! Copyright © 2008 - All rights reserved CorteCros d.o.o.